Li4Ti5O12 (LTO) has attracted considerable attention in lithium-ion battery (LIB) applications because of its favorable characteristics as an anode material. Despite its promise, the widespread use of LTO is still limited primarily due to its intrinsically poor electric and ionic conductivities and high surface reactivity. 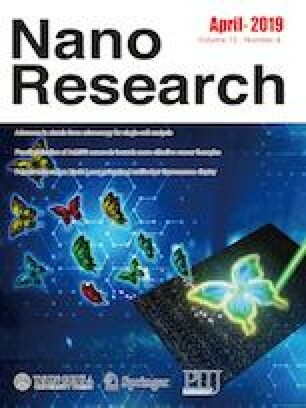 To address these issues, we designed polygonal nanoarchitectures composed of various Li–Ti oxide crystal polymorphs by a facile synthesis route. Depending on the pH condition, this synthesis approach yields multi-polymorphed Li–Ti oxides where the interior is dominantly composed of a Li-rich phase and the exterior is a Li-deficient (or Li-free) phase. As one of these variations, a polygonal LTO-rutile TiO2 structure is formed. The rutile TiO2 on the surface of this LTO composite significantly improves the kinetics of Li+ insertion/extraction because the channel along the c-axis in TiO2 provides a Li+ highway due to the significantly low energy barrier for Li+ diffusion. 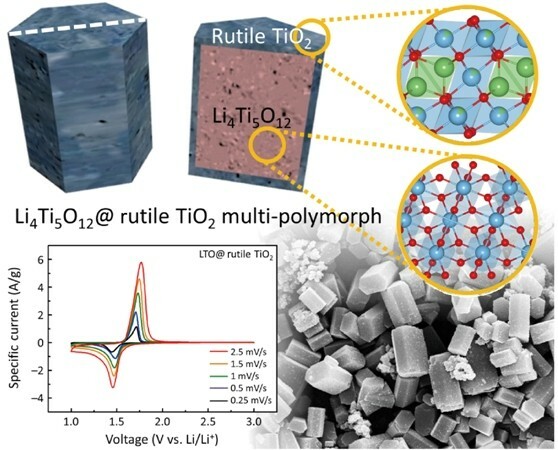 Moreover, the presence of rutile TiO2, which is less reactive with a carbonate-based electrolyte, ensures long-term stability by suppressing the undesirable interfacial reaction on LTO. Chang Hyun Hwang and Hee-eun Kim contributed equally to this work. Supplementary material is available in the online version of this article at https://doi.org/10.1007/s12274-019-2320-0. This work was supported by grants from the Basic Science Research Program through the National Research Foundation (NRF) of Korea funded by the Ministry of Science and ICT (Nos. NRF- 2016R1A1A1A05005038 and NRF-2018M3A7B8061494) and by the Ministry of Education (No. NRF-2018R1A6A1A03024231). This work was also supported by the Samsung Research Funding Center of Samsung Electronics under Project Number SRFC-MA1601-03.